What Does John 2:13 Mean? Each year, the Passover was a reminder to the people of Israel that God had delivered them out of slavery in Egypt. It was customary for the men of Israel to travel up to Jerusalem to celebrate certain feast days, and Passover was the first of these annual festivals to be commemorated. The Lord Jesus was starting His earthly ministry, and one of His first public appearances was attending the Passover in Jerusalem. He had already attended a wedding in Cana of Galilee, where He had turned water into wine, after which He spent a few days in Capernaum, with His mother, His brothers and His disciples. 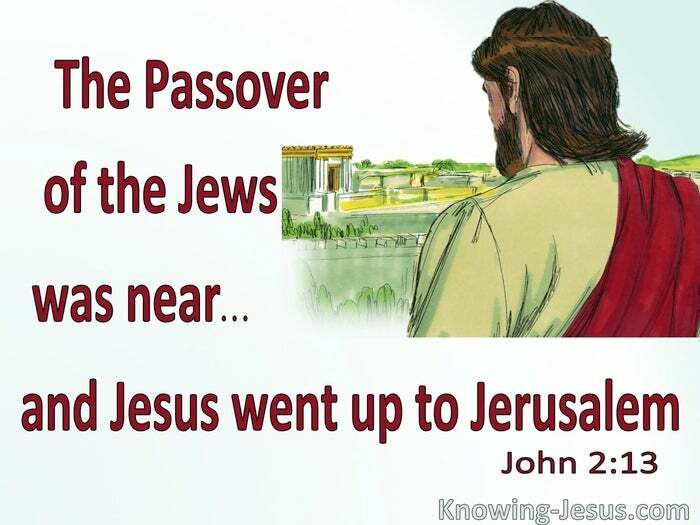 It was then that we read that the Passover of the Jews was near, and Jesus went up to Jerusalem. Jerusalem was the city of God where the Messiah -the King of Israel was to rule and reign in righteousness. He was to be crowned King by His people on the Holy Hill of Zion, and sit on the throne of His forefather David. Many prophecies had already been fulfilled by Jesus, which authenticated His claims. He has been born of a virgin in the little town of Bethlehem, as foretold by the prophet Micah, and was called out of Egypt following the death of the wicked king Herod. He was called a Nazarene, because he resided in Nazareth and John the Baptist had been calling Israel to Repent! For the kingdom of heaven is near. Wise men had been supernaturally led to worship the new-born King and some simple shepherd had been told the glad tidings that a Saviour was born. Indeed, they found Him wrapped in swaddling clothes, just as the angel had told them. And they witnessed a host of angels, glorifying God in their celestial chorus - the time for Daniel’s 70-week prophecy had arrived. 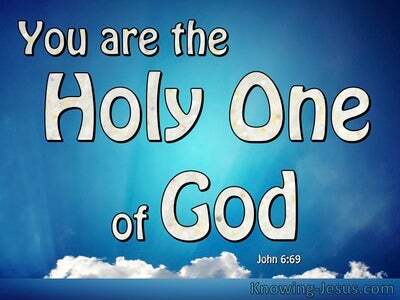 Jesus was ready to make Himself known. He had already been baptised in the Jordan by John and identified as the coming One – for John testified: when He came up, out of the waters of baptism, I saw, the Holy Spirit descending on Him, in the form of a Dove… and a voice came from heaven, saying, "You are my Son, Whom I love. I am pleased with You! The time had arrived for Jesus to reveal Who He was, and so when the Passover was near, He went up to Jerusalem. 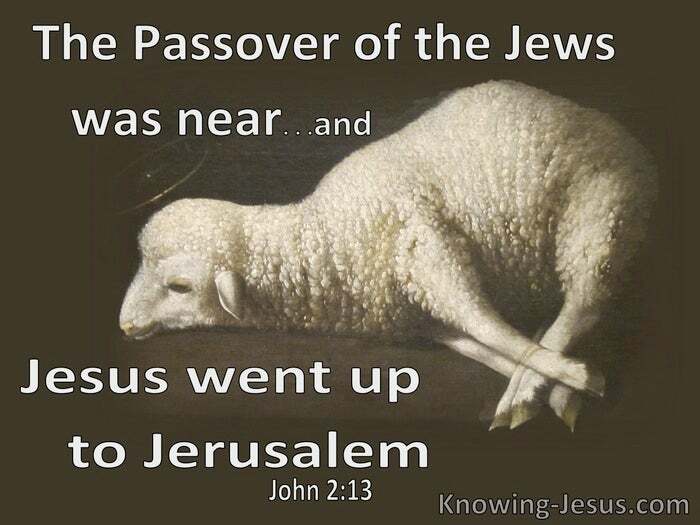 He went to celebrate the Passover as was the custom of the Jews, but little did His fellow countryman know that He Himself was the true Passover Lamb, Who would take away the sin of the world, by the sacrifice of His own atoning blood. The Jews had been waiting for many centuries for this Man, Who would save His people from their sin. He was sent by God to be the Good Shepherd of His people Israel, but He would be led as a lamb to the slaughter and would lay down His life for the sheep. He would accomplish man’s salvation by returning to the same holy City of God, only three years later to walk the Calvary Road, and be punished for the accumulated sin of the whole world. But Israel had become apostate over the years, and although God always had a remnant who trusted His Word and believed Him to be the anointed Messiah, it was national repentance from the entire nation that the Lord required. The whole nation had made a covenant with God at Sinai and so the whole nation must repent of its sins. 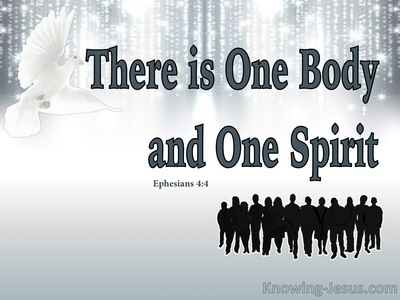 The combined ministries of John the Baptist together with that of the Lord Jesus Himself, did not bring the entire nation to cry out to Him for Salvation. And although a remnant of Israel confessed Jesus as Lord and acknowledged Him as the Messiah and Son of God, their promised kingdom was postponed, and their anointed King returned to heaven – until the entire nation of Israel, will cry out to Him for salvation. But let us never forget that it is by their transgression that salvation has come to the Gentiles. God is a God of order and He set out clearly what was required of His covenant people, Israel, in the Scriptures. He has also made it very clear that it is not His will that any should perish (Jew or Gentile), but that all come to repentance. 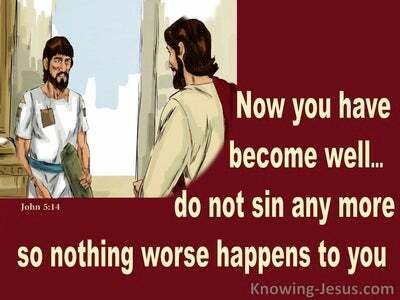 God has told us in His word, that all have sinned and fall short of the glory of God. The wages of sin is death but the gift of God is eternal life through faith in the death, burial and resurrection of His only begotten Son. And God will carry out His redemptive plans and purposes as laid out in His holy Word. May we trust His word and live by faith - to the honour and glory of His holy name. Heavenly Father, thank You that Jesus came to be the propitiation for our sins - and not for our sins only but for the sin of all who will trust in His name. We praise You for Your amazing plan of redemption, and that despite Israel's rejection of their Messiah, salvation has come to all who believe in Him. Thank You that Your plans for both the Church and for Israel will one day be completed, and we look for that any day return of Christ to take us to be with Himself. We pray for the day when the entire nation of Israel will call out to Christ for Salvation. This we pray in the name of Jesus, AMEN.